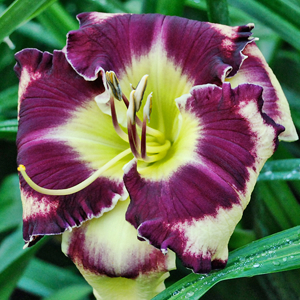 PIRATE MOON (Dan Trimmer) Tetraploid (Sdlg. X Tetra Eloquently Edged) 25" EM Re. Ev. 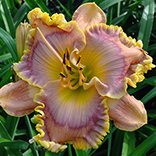 51/2" This Ivory Cream bloom has the look that is dominated by a huge black plum eye and edge that also shows very well on the sepals. The effect is spilled ink on white parchment. These blooms are outlined by a small silver edge, especially on the re bloom flowers. I hope the introduction of Jack Carpenter’s genes from ELOQUENTLY EDGED will lead to additional looks in our tetraploid lines. Remember there are still a limited number of genes from diploid conversions in our now more popular tetraploid introductions and we still need to expand our gene pool.